Edd Kimber, aka The Boy Who Bakes, won the first ever series of Great British Bake Off back in 2010. On Sunday 13th May he will be cooking and hosting a brunch at the lovely Good & Proper Tea cafe in Leather Lane, EC1, with a menu that includes chocolate babka, bakes eggs, and even a delicious treat to take home. Tickets are just £37 from Tast Tripper, and any profits from the event will go to the Hackney community charity Centre for Better Health supporting people who suffer with mental ill-health. "As part of our aim to connect people with great food and the people who make them we've asked some of our favourite cook book authors and friends to cook for you. All of the profits go to charity. Tickets include a feast of delicious sweet and savoury bakes, an Our/London cocktail and a treat to take away. * A delicious treat to take home. 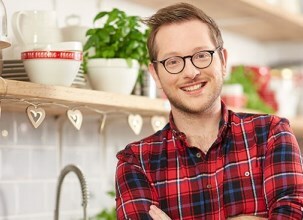 Any profit from our first event with Edd Kimber (@theboywhobakes) will go to Hackney community charity Centre for Better Health supporting people who suffer with mental ill-health."